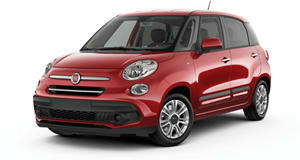 You can give the Fiat 500L the blackout treatment for an extra $595. The unloved 500L received a slight refresh back in 2017, and now Fiat has announced the return of the Urbana Edition for the 2019 Trekking trim with new standard features that add further customization choices. Essentially, the Urbana Edition gives Fiat’s quirky family minivan the blackout treatment. Unique exterior features include standard 17-inch gloss black aluminum wheels, as well as Miron-black accents on the door handles, body-side moldings, fog lamps, side mirrors, and fascias. Inside, the 2019 Fiat 500L Urbana Edition comes with black leather seats with copper stitching plus a unique dashboard with an ingrained copper 500 logo. Five exterior paint colors are available: Black, Bronzo Metallizato (bronze), Bianco (white), Grigio Scuro (gray), and Verde Bosco (green). Four of these colors can also be ordered with a contrasting black roof. "Our Italian-designed, fun-to-drive Fiat 500L offers best-in-class standard horsepower and torque along with the ultimate in seating and storage configurations,” said Steve Beahm, Head of Passenger Car Brands at FCA. "The Fiat 500L Urbana Edition goes further with new standard features that add even more personalization options for a standout appearance." Like the standard Trekking model, the 2019 Fiat 500L Urbana Edition is powered by a 1.4-liter turbocharged engine that sends 160 hp and 184 lb-ft of torque to the front wheels through a six-speed automatic transmission. While the Fiat 500L in Trekking trim starts at $23,325, the 500L Urbana Edition is available for an extra $595 and will arrive in dealerships this spring.